Hanna Stamps! We're Changing things up!!! We're making some changes to our Challenges at our next release party, which incidentally will be the 8th of September. We will no longer be posting challenges on that evening, but will be posting a Challenge the Week Before the Stamp Release. Because we aren't having the release party until Tuesday the 8th, you will have 8 days to enter your creations. The winner of the challenge will be posted at the release party between 9:30 and 10:00 p.m. I sure hope you will all play! You should be able to see the posting for the challenge somewhere in THIS THREAD tomorrow! Sure hope you will play!!! 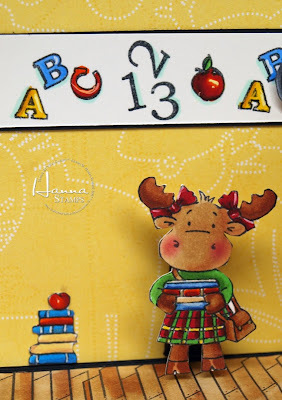 This card is made with the Mommies to be set from Hanna Stamps. Paper is from the Debbie Mumm Baby Collection, with a base of Kiwi Kiss. Ribbons and Buttons are from SU! Well! Here I am , the hostess with the Mostest this week!!! The Mostest what, I am not sure, but it sounded kinda catchy, don't ya think??? This challenge was really Simple! Create a card using Traditional Christmas Colours-Green, Red and a splash of Silver or Gold..............remember the Christmas Song Silver and Gold??? Yep, love hearing the voiceover of Johnny Marks (who the heck is HE?? I always thought it was Burl Ives singing it, but I guess he was just the voice of the Snow Man, in Rudolph the Red Nosed Reindeer. Silver and gold, silver and gold Ev'ryone wishes for silver and gold How do you measure its worth? Just by the pleasure it gives here on earth. Silver and gold, silver and gold Mean so much more when I see Silver and gold decorations On ev'ry Christmas tree. What's a Christmas tree without tinsel and pretty silver and gold decorations? Can't really call it a Christmas tree now, can you? And think of all the fun and joy that would be lost on Christmas morning if all the young folks didn't get to see that sparkling happy tree. Anyway, I LOVE LOVE LOVE that song!!! I used this cute image from Big Celebrations, a retired set from SU! The DP is Scenic Route and the Base is Kiwi Kiss. I was so sad when SU! retired this colour!!!! Ribbon is also from SU! 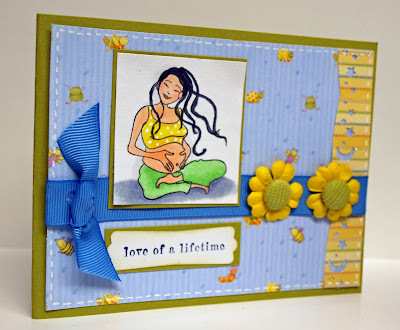 The Sentiment Chipboard is from Scenic Route! 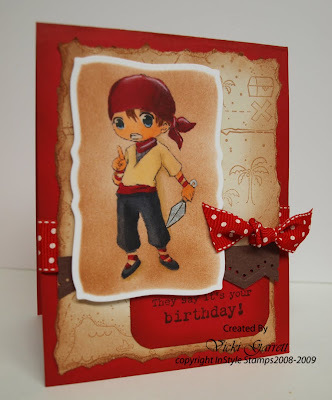 Maria has posted a great sketch to go along with this challenge if you choose. 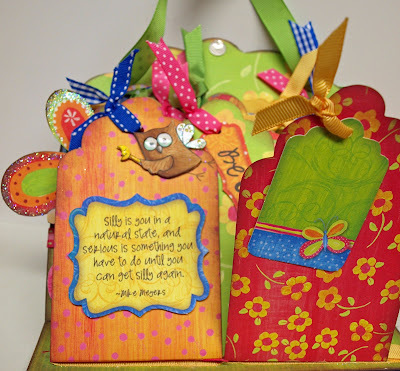 Check out the CSAYL Blog to see what the Design Diva's have created and add a link for your creation! When I was in Detroit earlier this summer visiting Kristi, She treated me to a Prima Colouring Class with Paula. If you've never been to her blog, you really must do so~! She is uber talented!!!! This is one of the images that she taught us to colour in class!!! Ginger, a terrific Ketto Image from Stamping Bella was one of three images that we coloured in the class. I got so many teriffic tips that day from Paula, that my once untouched Prism Pencils have seen quite a bit of action as of late!!!! She had us adding glitter and glaze to our images, which just made them all the prettier!!!! 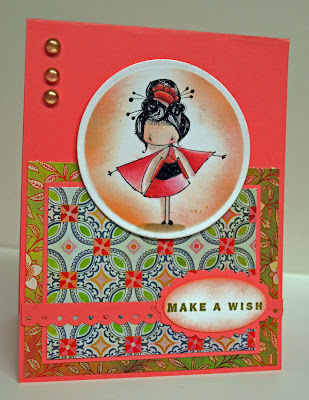 I used a base of Cameo Coral on this card as well as DP from Basic Grey's June Bug Collection! Wish I lived closer so I could take more of Paula's classes!!! She's the Master of Primas!!!! InStyle Stamps Hoppin' for new Digi Images! It's that time again!!!! 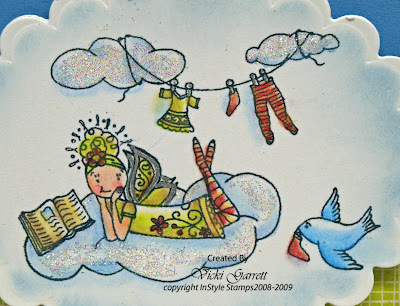 Friday Blog Hop at InStyle Stamps Check out some of the Fabulous Images that Virginia has for you this month!!! These images are from the Digital Retro Collection and they are so fun to work with! The neat thing about Digi images, is that you can resize them to your liking. 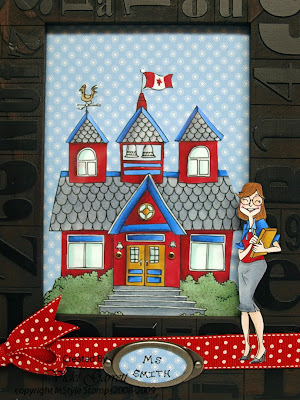 I was able to resize the School House to Five Inches wide in order to create this funky Teacher Frame! The Teacher Stamp is Sized at 3.5 inches tall!!!! I found this very cool frame at Michaels on sale for $7.00, a steal in my opinion!!!! Designer Paper, Hardware and Ribbon are from SU! Colouring is with Copic Markers! Little Holly is having a blast playing Hopscotch............Sidewalk Chalk is essential for a good Hopscotch game!!! Luckily, they had a little left at the Dollar store and the cool thing is that it came in a clear box!!!! DP is from SU!, The Ribbon from the Dollar Store, punch from Martha Stewart and Rub on from SU! You can find these images and more at ISS today!!! Check out the DT blogs for more great ideas and then go to the ISS BLOG for a chance to win a DIGI image! I think you get to vote on the Designer Projects as well, which will allow the Designer to win a free Image as well! These are my final Projects as an ISS Guest Designer! Thanks to Virginia, Melissa for the wonderful Opportunity and to the ISS Divas for their warmth and kindness!!!! You'll be seeing more ISS on my blog in the future, I definitely love their Schtuff!!!!! lived and perhaps Autumn is here already. With only having a handful of dog day summer heat, it seems too soon. That being said, Autumn is my favourite Season, so I truly don't mind. I love "Sweater" weather. There's a crispness in the air that is so refreshing and I love the smell of burning leaves and woodstoves. It's really still too early to tell, but I'm hoping that it's the start of a glorious Fall! 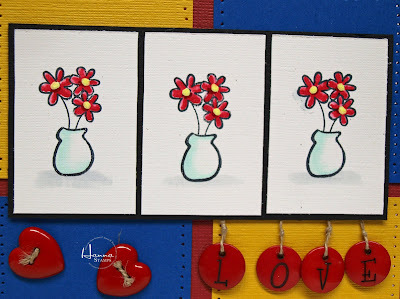 I created this card using the Flower Pot from the Hanna Artist Set. Pretty Bright eh?? 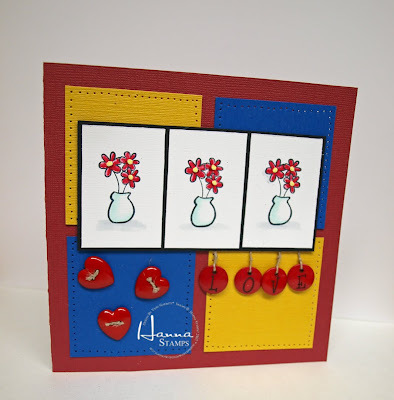 It was a Challenge to create a card with Primary colours. So here they are in all their glory!!! Image is coloured with copics, Colours: Brilliant Blue, Summer Sun and Real Red. 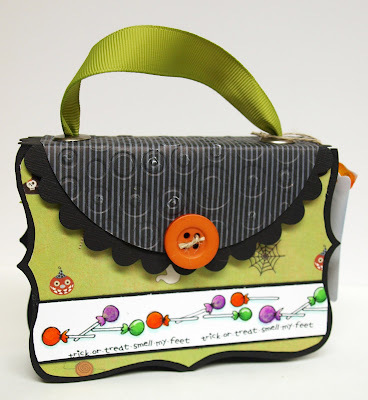 The Buttons are from Michaels and Doodlebug! Working Frantically here on DT committments!!!! 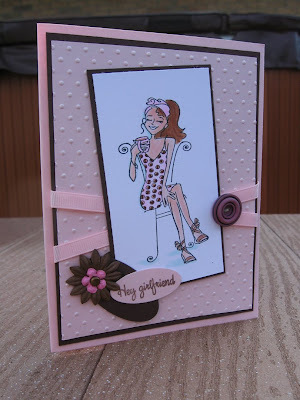 Stay tuned tomorrow for the InSTyle STamps Blog Hop!!!! I always find Sympathy cards tough to make.....I know, I've said it before and it's true. I just want to make sure that the card conveys a caring look and message. It's too bad that cards aren't just for Happy Occasions, but maybe a hand stamped card in this case really shows your regard for the receiver. I made this card for a dear friend of my Mother, who lost a loved one. I hope it brings her comfort at this sad sad time. This is pretty much a clean and simple design. 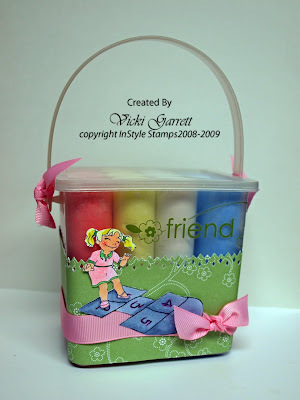 Image is from Stampin' Up! Colour combo includes Almost Amethyst and White. 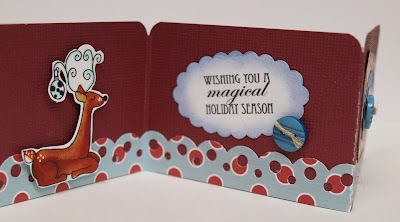 I used a Quick Cutz embossing template to add a little dimension to the back ground. 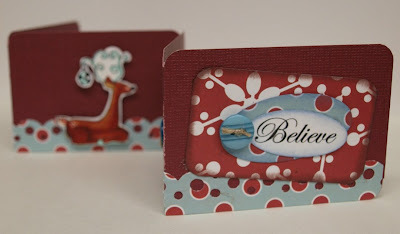 I cut a Nestablilities Scalloped Square in Half to use as a base for the Sentiment, which is also from Stamping up. The Ribbon and the decorated stick pin are from the Pretties kit from SU! Still practicing with my Prism Pencils, I added a wee bit of Stickles here and there to highlight the flowers and butterfly. I've been working on release projects, so my blog posts have been scarce as of late. See you soon with something new!!!! Now this was a fun fun card to make! 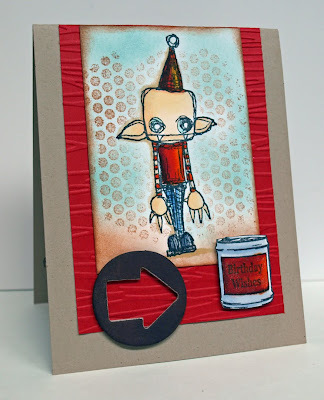 I got the idea for this card in my Stampin' Up! Stamping Success Magazine. One of these days, I'll get around to making a tutorial for you, but it's been a very eventful summer and I haven't been home much! 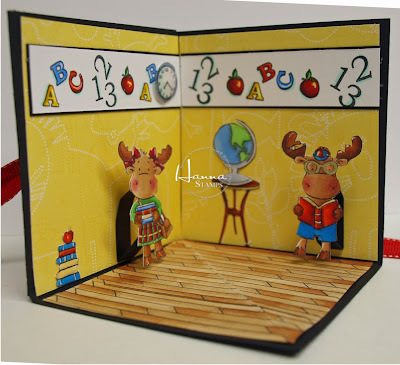 The card is made with Sophie and Riley School kids, Hanna Teacher Set and the Wood Floor Set. It was so much fun to make! I used copic markers to colour the images along with some white and gold gel pen. I always accent the cheeks with Stampin' Up! Pastels. I find that I can get just the amount of coverage I'm looking for as well as acheiving a somewhat Translucent look! 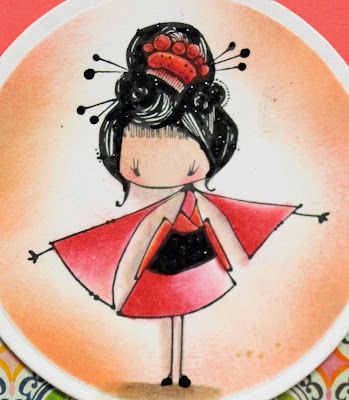 Sophie is a newly release image from Hanna Stamps. I don't know if it's very noticeable, but I used some Crystal Effects on the Clock Face.....looks pretty cool in real life! This is the outside of the card! What a surprise to pop it open and see the cool scene inside! 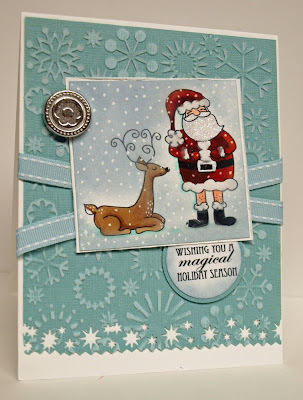 Christmas Stamping All Year Long and a Sneak Peek! 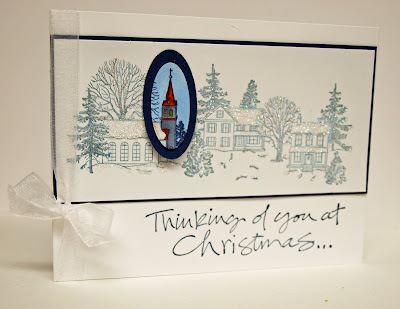 Maria designed a fabby sketch for us this week over at Christmas Stamping All Year Long. 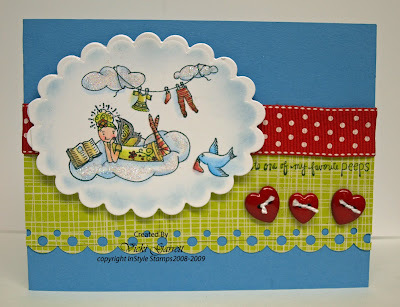 I just love this layout and thought it would be perfect to show you this soon to be released set from Hanna Stamps! This sweet little Christmas Elf comes with some cool accessories, like a Fireplace a Christmas Tree and some other cool little goodies!!!! I also used the just release Floor Stamp in the main images! I used to draw my own floors, but this stamp makes it quick and easy! I coloured the main image with Copics, using some white gel pen for a highlight. 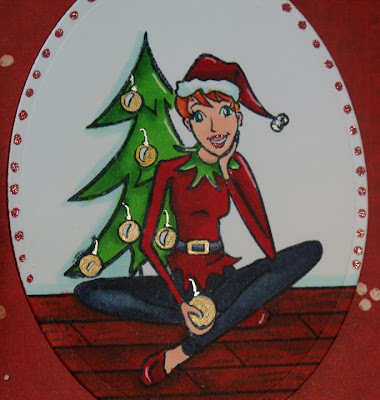 In addition, I used a Pentel Gel pen to colour the metallic gold Christmas Ornaments. The New Lipstick Spica Pen from Copic makes for a neat little border!!!! Designer Paper is from Scenic Route. How are you coming with your Christmas Cards????? 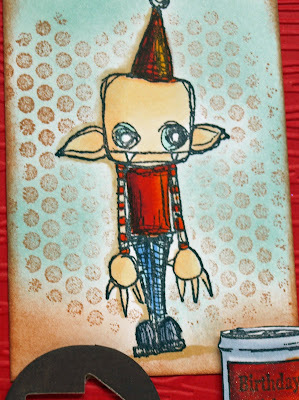 This is a fun and funky Birthday Card that I made for one of Jon's friends with Bat Boy from Stampotique! He almost looks like he has a little Marshmallow head! So homely, that he's cute!!!! Well, I like him anyway! I love the unique images illustrated by Daniel Torrente. 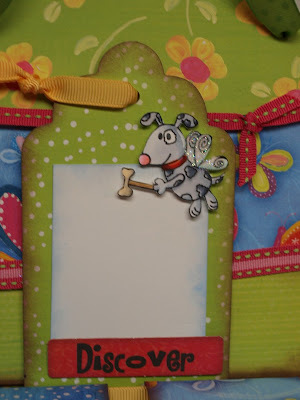 The Honeycomb Background Stamp is also available at stampotique as well as the sentiment. There's nothing too fancy about this card! Basically Kraft and Real Red with some Soft Sky and Creamy Caramel Sponging. The Chipboard is from Maya Road. See you soon with some more Yummies!!!! lol! Kristi and I are stamping up some fun samples. 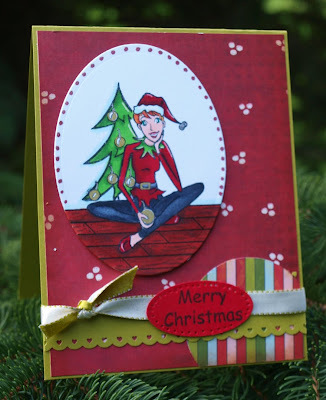 Check my Blog on Monday to see a yet to be released Hanna Christmas Stamp! WAY WAY WAY cute!!!! What do you think of Cynthia?? I was REALLY excited to see this image arrive from Virginia at InStyle Stamps. Cynthia is a new Fairy Stamp that will be released a little later this month! Cynthia LIKES to do Laundry.....................hmmmm I have heard that are certain chores that people prefer but LAUNDRY??? Well I suppose if I had a sweet little bluebird to help me, I'd be okay with it! 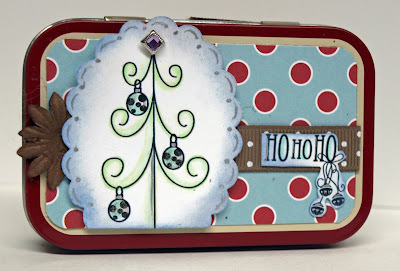 Cardstock is Brocade Blue from Stampin' Up! 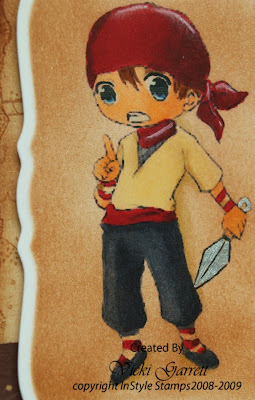 Image is coloured with Prism Pencils and Gamsol......love this technique.....I'm still practicing Paula!!!! Hope to be posting something else tomorrow..........just have to get back to the drawing board!!!! 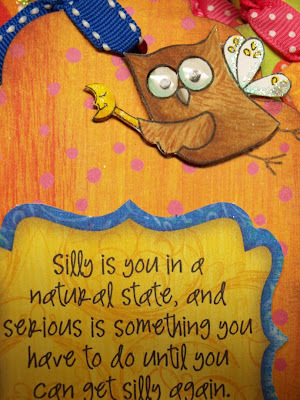 I made this card with Nico from InStyle Stamps! 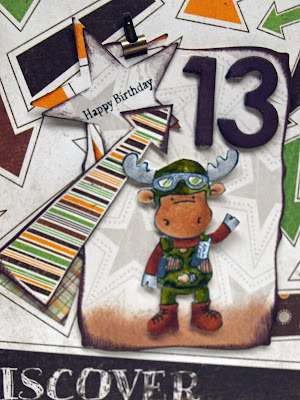 It was a card that came together very quickly.....the background paper is created with a retired Stampin' Up! Wheel and sponged in Creamy Caramel Ink, as are the reat of the pieces. 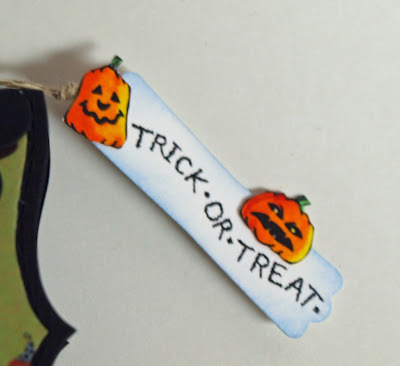 Got some new Grosgrain from Stampin' Up! I love the dots!!! Well, gotta run! The ACDC concert was totally FABULOUS, but needless to say, I'm running a little behind this morning! Did you know that some of the most popular Hanna's are available in Red Rubber? These images are a little smaller than the Clear Hannas and are mounted on Cling!!!! Aren't they fabby? Head on over to Hanna Stamps to check them out!!! I am the hostess for the CSAYL Blog this week! The technique-Spotlighting! This is a very easy, but effective technique. Basically all you do is stamp an image in one colour. 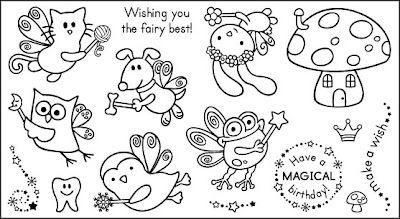 Then you will stamp the image again, punching or cutting out the part of the image that you would like to see spotlighted, colouring that piece and mounting it over the main image. Easy Peasy! 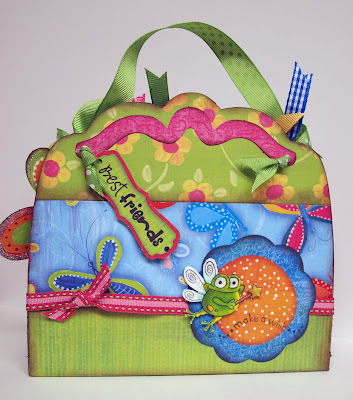 Head on over to the CSAYL blog too see all the great creations! Stamp is from The Stamp Barn in Ottawa Ontario. Funny I should use this image. I'm off to see AC DC in Ottawa today!!! Very excited and lots to do before I leave, so I better run! It seems only yesterday that I held you in the crook of my arm, rocking you and just drinking in the wonder of you. It seems only yesterday you giggled in glee while feeling the wet grass beneath your feet for the first time. It seems only yesterday I followed the school bus, tears in my eyes to make sure you got into the school safely for the very first time; you looked so small lined up along the red brick wall. It seems only yesterday I watched as you rode your bike for the first time without training wheels, your grin lighting up the cloudy day. It seems only yesterday that I carried you, seems only yesterday that I cuddled you, seems only yesterday that I dreamed of being a mother. How is it that you grew up so fast? In the blink of an eye you stand taller than me, have developed an out of this world sense of humour, a teenager now. My Teenager. I still drink in the wonder of you. In just another blink of an eye, you will be a man. 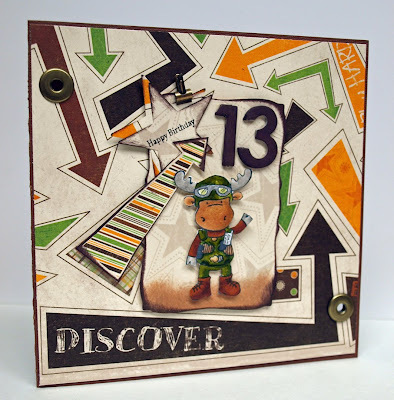 I'm hosting the Friday Challenge over in the Hanna Stamps Forum today. 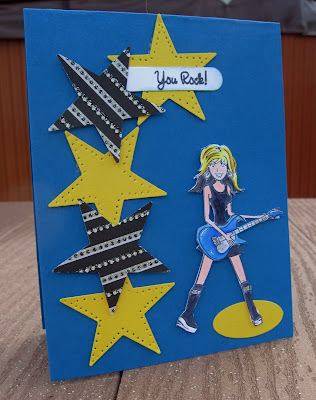 The theme for the challenge is to create a card for a teenage boy. Only fitting to use G.I. Jon for my card as Kristi named this Riley for Jonathon. Isn't this the coolest paper? It's U Bug me, from Bo Bunny Press (Arrows) Card base is Brown from Coredinations. 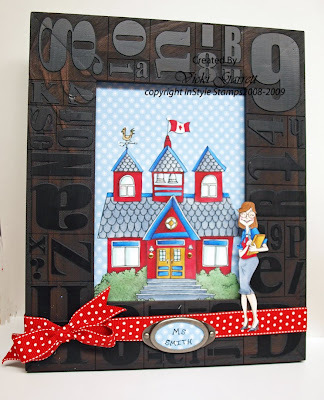 Chipboard and Big Eyelets from from Stampin' Up! 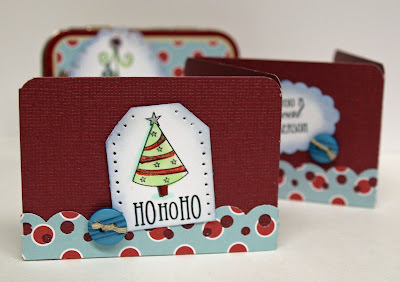 Our Craft Lounge Blog Hop Today!! Beaucoup de Blog Candy!!! 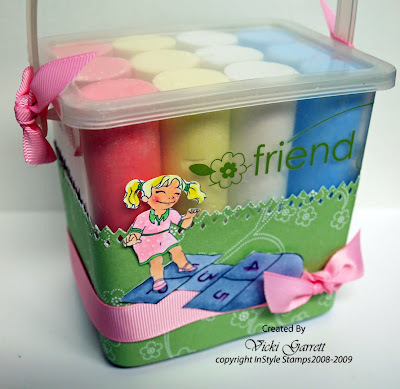 Would you like to win this super cute stamp set? Make sure you leave me a comment and your name will be entered into a random draw for this set! You have until 9 p.m. est on Sunday August 9th to leave your sweet sentiments, what I would like to know, is what is your favourite Halloween Candy!!!! Mine are Molasses Kisses! 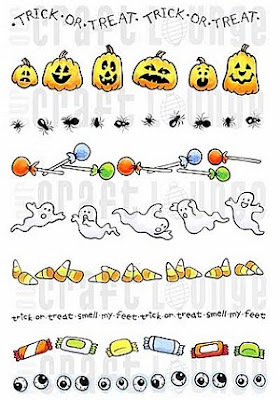 Although I am a long time Chocoholic, I really enjoy these chewy confections at Halloween! 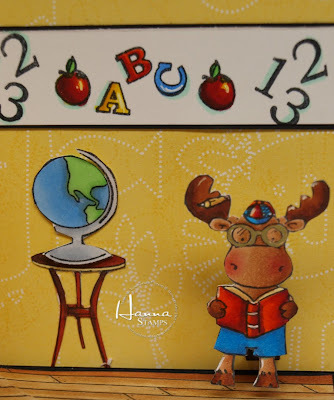 Even better, you can hop to all of these blogs as Our Craft Lounge is giving one of each of the 31 new release sets out!!! How COOL is that??? Make sure that you leave your contact info with me. OCL wants to share the love, so you can only win one set. If by chance, you win more than one, you'll be contacted and will get the set of your choice and another lucky stamper will win the other! These sets will be released to retail and online stores today.......please head over to OCL to check it out!!!! 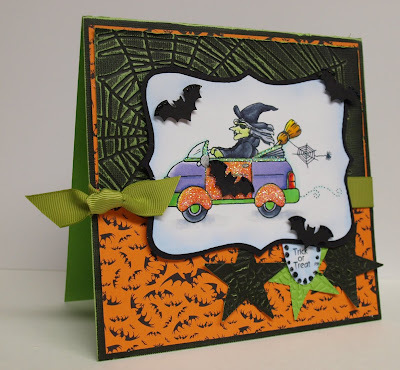 This was a quick little card created with the Pumpkin cut outs in the borders set, so Spooky Borders are not only for borders, they're more versatile than that!!!! Gotta love that K&Co. 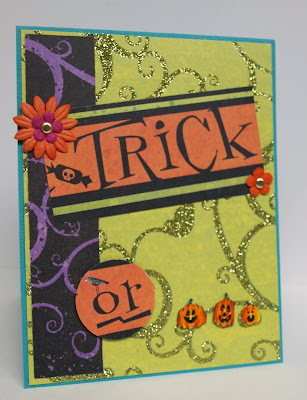 Halloween Paper, all glitzy and glittery!!!! That covered my background, sentiment and accents. Base paper is from Coordinations! 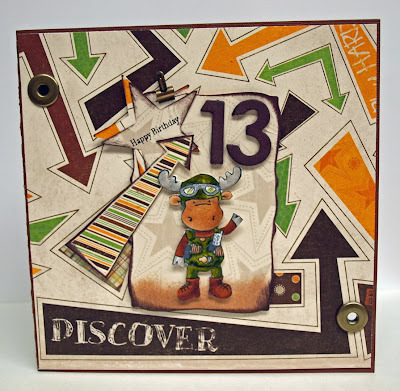 Now this was a fun little project to construct using Stampin' Up Top Not and Large Scallop Die. It will definitely hold a few Molasses Kisses for sure!!!! 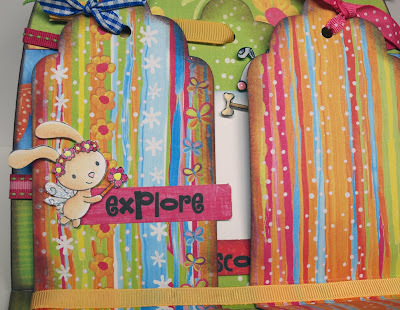 DP is from Imaginisce, Striped Paper from Martha Stewart. The images are coloured with Copics. 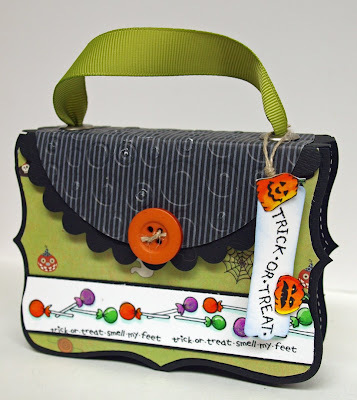 The sentiment is punched out with the new SU label Punch and some more pumpkin cutouts to embellish! 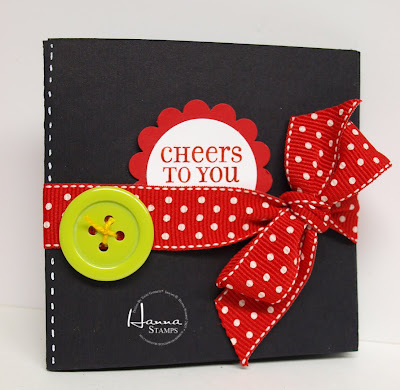 Button is from Foofala, Linen Thread and Olive Ribbon from Stampin' Up! Fairy Friends can be yours Today!!! Just head on over to PINK CAT STUDIO to get your set!!! I had so much fun with these little guys! All the little characters are absolutely adorable and I can't wait to create with them some more! Also, I am looking forward to finishing my Pinecone Press Purse Book with Pictures and Journalling........... I have a special friend in mind for this project.......now just to get on with it! How fun is THIS???? Little Witchy is flying by with Trick or Treat Wishes!!! This set is absolutely FABULOUS!!! I wish that I had time to conjour up some more creations, but if you hop on over to THE LOUNGE you can see some other great samples made with this set, as well as sneak peeks for ten more Fabby sets!!! I can't WAIT to get home from work today to see what the OCL Design team and friends have in store for us!!! I coloured the image with Copics and then used my SU top note die to cut out the image as it was the perfect size! 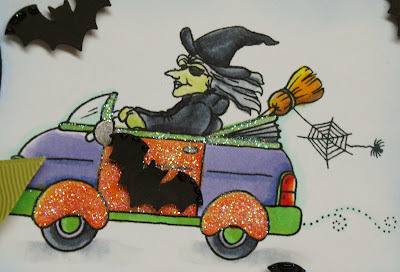 Lot's of Glitz and Glitter for Halloween is always fun!!! My Card Base and Cuttlebugged piece is made with Coredinations Black Magic Paper. I cuttlebugged, sanded and wiped with a damp cloth to bring the core colour out through the black. DP and the Bat Punch is from Martha Stewart. Other Punches from SU! Don't forget to come by tomorrow for the blog hop! You'll have the opportunity to win the set that I am featuring on my blog tomorrow! Pink Cat Studio Sneaks Day Two! Here's a little more of my Purse Project to show you!!! 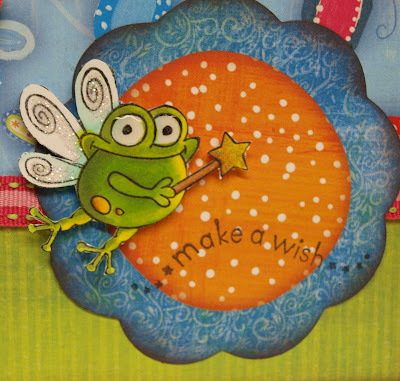 The sweet Froggie is the central point to this whimsical themed album kit by Pinecone Press. If you check out yesterday's post, you can get the links to Scrapping Great Deals, where it can be purchased. A little Glitter and some Crystall effects, makes this wee Froggie POP! Look at this little Dog! Isn't the Dog Biscuit Wand just way too cute!!!!! Lots of posts for you this week!!!! Tune in tomorrow for the final Reveal of the Pink Cat Sets!!!! Our Craft Lounge Sneak Peeks!!!! Some Delicious Sneak Peeks for you today from Our Craft Lounge! This first little project is made with the SU! Pillow Box Template for the Big Shot and Gingerbread Fun! Quick and Easy! 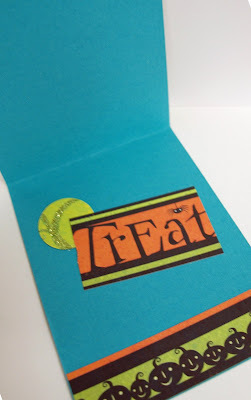 I like to do these quick projects.......sometimes I can spend hours toiling away at one card and it sure is nice to be able to do a quick one, once in awhile! Gingerbread Fun is a clear set. I used October Afternoon DP layered over cardstock to make it firmer, SU narrow Grograin and a heart button threaded with SU linen Thread. I am totally Lovin' the Reindeer Kisses Stamp Set. There are lot's of sweet images and sentiments in this one! Just perfect for my Christmas Card Blog group Projects, so I'm sure that you will be seeing more and more of this awesome set. Reindeer Kisses is also a clear set. I used Coredinations Paper, which allowed me to sand off a nice finish after cuttlebugging it with the snowflake template. The border is punched with a Martha Stewart Punch and I added a SU flower brad and ribbon to finish it off. The Sponging is done with Aspen Mist Versamagic chalk ink. 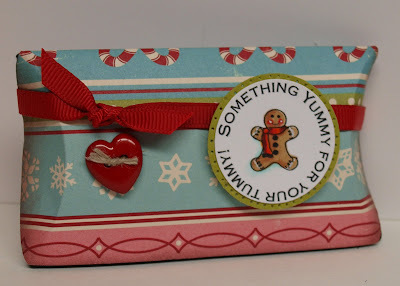 The inspiration for this project was sparked off by my good friend Donna, who brought Altoid tins to our Stampin' Chicka's weekend and challenged us to make something! I was going to make a gift card holder, but it transpired into a long long card! All these fun images are from the Reindeer Kisses Set. I Beleive the DP is from Three Bugs in a Rug, but I am horrible about saving the label bands off the paper. Check back on Wednesday to see projects from more of the new sets. AND ... on Thursday you will definately want to check back because we are having the BIGGEST BEST RELEASE PARTY & BLOG HOP EVER! We will show you all the images from each set, have more great projects and give away TONS of blog candy and we'll let you know where you can purchase your sets. All 31 sets will be available for purchase from our retailers starting on Thursday!If that wasn't enough, there is one more piece of very exciting news to share. OCL has a brand new blog called THE LOUNGE!You will definately want to check it out every day this week because it has a list of all the girls showing sneak peeks. There are over 20 samples showing today alone on various blogs & I know you WILL NOT want to miss a single one! THE LOUNGE will be PARTY CENTRAL this week for sure! See you tomorrow!ETA: Today, Tuesday and Wednesday are sneak peeks only ~ the fun blog candy will start on Thursday and the drawing will be on Sunday. 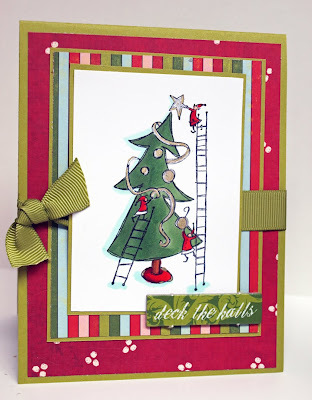 Christmas Stamping Quick and Easy! Hanna Sneak Peeks Day Two........lets get Wild!